#2 1st Mar 2018 at 8:06 PM Last edited by Menaceman44 : 1st Mar 2018 at 8:19 PM. Is there any chance you could make a version that retains the skill requirement for the dance but change it to Dancing skill instead of Culture skill? #3 1st Mar 2018 at 8:12 PM Last edited by icemunmun : 1st Mar 2018 at 8:22 PM. Is there any chance you could make a version that retains the skill requirement for the dance but change it Dancing skill instead of Culture skill? 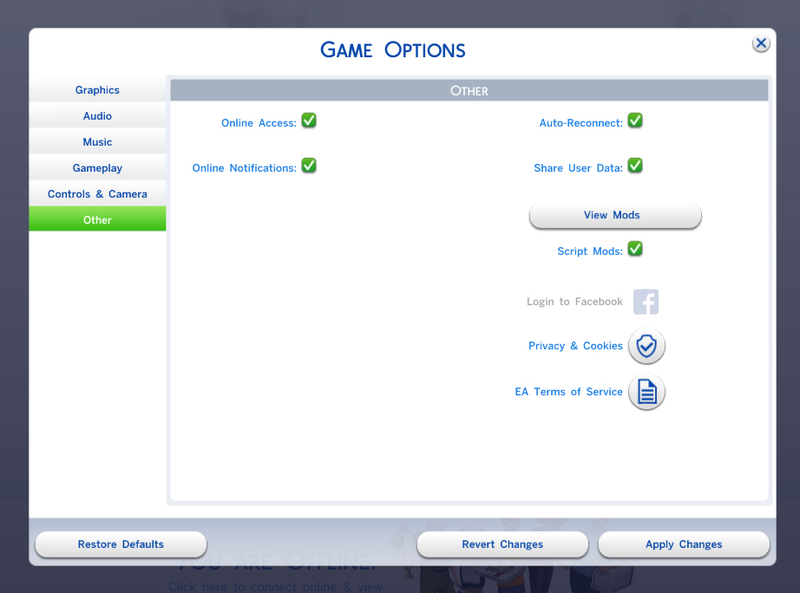 I mean how sad is it that EA couldn't even make a new tree mesh for the Berry Tree?! #5 3rd Mar 2018 at 10:05 PM Last edited by icemunmun : 3rd Mar 2018 at 10:28 PM. Ah yeah. i do plan to look into those! Seriously though it would have been so better if an extra tree mesh was added! I came for the skeleton mod! Out of curiosity, is it possible for you to make skeletons not age either? Maybe a separate flavor? It doesn't exactly make sense for skeletons to age lol. #6 4th Mar 2018 at 1:18 AM Last edited by zeldagirl180 : 4th Mar 2018 at 1:46 AM. I really love the mod, and I'm glad the no aging can be done, did some testing though, and I believed it's a bit buggy. My sim was originally just blessed by a treasure chest in a temple, which normally lasts forever but now lasts two days. The issue is, I cannot remove the buff to get rid of being a skeleton. I have tried right clicking it (I have the mod that lets you remove buffs by right clicking), I have tried using the remove moodlet cheat, everything I can think of. Even restoring humanity and turning into skeleton does nothing. Perhaps he did the revert to human autonomously and it bugged it? Did you tag the cheats as autonomous? However, when I use the restore humanity cheat, the romance options are available, and I am able to change outfits (yet all the outfits are just the skeleton costume). I still have skeleton interactions and no dropping of needs however. Using the turn back into skeleton cheat removes the romance option and change outfit ability. #7 4th Mar 2018 at 2:52 AM Last edited by icemunmun : 4th Mar 2018 at 3:09 AM. One question - Are the curse buffs removed by the Restore Humanity interaction ? Basically, if you only use the cheat to become a skeleton and remove it, it works fine. But the cheat does not remove the buff that is given to you naturally in game, either by using the Skeleton Relic or by a random encounter in a Temple or a chest. These are great, especially the light fix. Now I might actually use some of these new lights! I do have a suggestion/request, however... Would it be possible for you to make a small mod that would make sims automatically pick up artifacts after authenticating them? It would be so awesome if you could, because then we could queue up a bunch of artifacts to uncover/authenticate instead of having to wait until each one gets done to start another one. Feel free to PM me with any lot requests. I've mostly done house trailers in the past. I am absolutely loving this now, I really look forward to seeing if you can prevent Aging while a skeleton, that's all I need to make this life state feel complete to me! If I may be so selfish to ask for another request, is it possible to add the "Restore Humanity" Function to the Statue that cures diseases for a possible simoleon charge? That way we have a way to cure the Lifestate without using the cheat. If that is too complicated then maybe just a new bar drink, or eating Ambrosia cures it etc, just to name a few ideas. I am trying to make the skeleton feel more like a permanent life state, and your mod is definitely helping! I understand if you don't have the time or if this isn't really possible, just thought I'd ask since I don't have the skills to mod them, despite trying lol. I added the Humanize option to the skeleton. 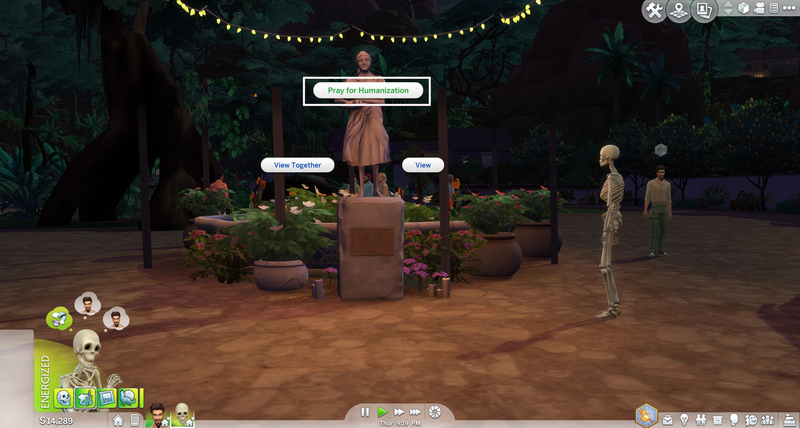 I also made a Skeleton trait so that you can apply it from CAS to hopefully disable ageing ( also its less cheaty ). But the skeleton form will only be applied when the sim exists CAS. I believe I found a bug with the skeletons and the pets pack. So you know how as a skeleton you cannot change outfits? You can't change the outfits of pets while being a skeleton. For cursed skeletons too or only by changing with these cheat interaction ? Also, wow, you were quick with these mods.